All of us profit from being corrected- if we're corrected in a positive way. All that hullabaloo about somebody's net worth is just stupid, and it's made my life a lot more complex and difficult. Appreciate everything your associates do for the business. Exceed your customer's expectations. If you do, they'll come back over and over. Give them what they want- and a little more. Give ordinary folk the chance to buy the same things as rich people. 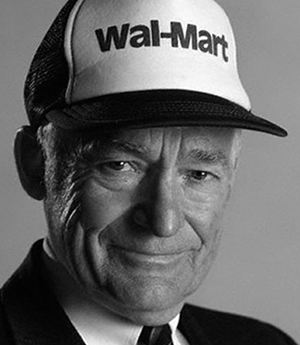 I don't know what would have happened to Wal-Mart if we had laid low and never stirred up the competition. My guess is that we would have remained a strictly regional operator. I got into retailing because I wanted a real job. I have always been driven to buck the system, to innovate, to take things beyond where they've been. I pay low wages. I can take advantage of that. We're going to be successful, but the basis is a very low-wage, low-benefit model of employment. I've never been one to dwell on reverses. If you love your work, you'll be out there every day trying to do it the best you possibly can, and pretty soon everybody around will catch the passion from you- like a fever. If you want a successful business, your people must feel that you are working for them- not that they are working for you. If you want the people in the stores to take care of the customers, you have to make sure you're taking care of the people in the stores. That's the most important single ingredient of Wal-Mart's success. Ignore the conventional wisdom. If everybody else is doing it one way, there's a good chance you can find your niche by going in exactly the opposite direction. In the beginning, I was so chintzy I really didn't pay my employees well. Individuals don’t win, teams do. It's just paper-all I own is a pickup truck and a little Wal-Mart stock. Keep everybody guessing as to what your next trick is going to be. Loosen up, and everybody around you will loosen up. Many people just wait around for something to 'turn up.' They might start with their sleeves. Money and ownership alone aren’t enough. Set high goals, encourage competition, and then keep score. Most of us don't invent ideas. We take the best ideas from someone else. Nothing else can quite substitute for a few well-chosen, well- timed, sincere words of praise. They're absolutely free and worth a fortune. The folks on the front lines- the ones who actually talk to the customer- are the only ones who really know what’s going on out there. The key to success is to get out into the store and listen to what the associates have to say. The more they know, the more they’ll understand. The more they understand, the more they’ll care. Once they care, there’s no stopping them. There is only one boss- the customer. And he can fire everybody in the company from the chairman on down, simply by spending his money somewhere else. To succeed in this world, you have to change all the time. We let folks know we're interested in them and that they're vital to us. cause they are. What am I supposed to haul my dogs around in, a Rolls-Royce? You can make a lot of mistakes and still recover if you run an efficient operation. Or you can be brilliant and still go out of business if you're too inefficient. You can make a positive out of the most negative if you work at it hard enough.